The National St. David’s Day Parade takes place on Sunday March 1st in Cardiff City centre. This non-military parade is an opportunity for those who live in Wales, regardless of age, ethnic or social background, to join a dignified and imaginative celebration of Welsh heritage and culture. This year the Parade will start outside Cardiff City Hall.To complement the Parade entertainment with a Welsh flavour will be performed from a bandstand in Cardiff Castle at the end of the Parade. Entrance to the castle at the end of the parade will be free to all from 1.00 p.m. to 4.00 p.m. 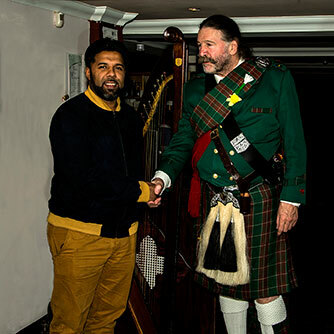 The Scottish Pipe Band, along with Parade organisers and dignitaries, will once again be sampling a special Welsh inspired menu at the Juboraj in Mill Lane. This annual curry has been put on by Juboraj for the last few years as part of the Juboraj’s on-going association with the parade. The Juboraj is proud to be part of the celebration of Welsh culture represented by the Parade.